Winter in Sapporo arrived in sudden; even the early snow (初雪) was rather massive. The amount of snow was enormous for someone who came from the tropical zone. The accumulation of snow which later turned into ice made mobility difficult. Fortunately, the snow melted after a few days. However, as the days of flurries, freezing icy rain and heavy snow are increasing, the whole earth is rapidly covered by slivery and powdery snow. At the same time, I am adapting poorly with the pace of living here. The icy road becomes thicker and unsaved for cycling. I have to relearn to walk on icy path; even with a pair of good trekking shoes, I still slipped but fortunately did not fall. It is amazing to see the local folks run and skate with flat or high heel shoes. The anticipating snow is going to be increased and it will definitely slow down my pace. As the world is getting frozen; most of the outdoor activities become unsafe and inconvenient. I am spending more time in the institute; reading and studying. It is warmer to stay together with study-mates. Constant discussion and sharing of information make study more effective. I must appreciate the remaining month to gain more knowledge on dermatopathology and achieve my target of completing the whole textbook of McKee. I was surprised that my second-hand bicycle was stolen when the snow started. I felt regretted than I can’t pass such useful vehicle to the next trainee in this institute. It had served me well for bringing me around Sapporo within these 5 months. The previous prolonged summer delayed the arrival of the foliage in this autumn for at least 10 days. However, the metamorphosis of the leaves colors is sudden. The whole mountain has turned into golden yellow overnight. Maybe, the daytime is shorter and I didn’t spend much time outdoor during this transition period. After observing for 3 months, I get the opportunity to key in the diagnosis code by myself. Trained as pathologist, I am used to type report but I would never imagine of typing in Japanese 日本語. The coding system created by Dr Kimura in the diagnostic work makes my duty easier. Furthermore, I like the typing shortcut of narration for way of cutting, margins, clinical-pathological correlation. けんた、ちし、たんの、とれきれし、せつはんしか、are the new Japanese terminology that have imprinted in my memory. In order to make the report more complete, I use a lot of copy and paste function; adopting from the previous similar cases. However, I am still insuffiencient of describing in more details. This hand-on training sharpens my diagnostic skill as I have to be committed with my diagnosis. It is totally different from the earlier months in which I just glanced through the slides without any responsibility. I am strongly agreed that good diagnostic skill can only be derived from the extensive of exposure and appropriate guidance. I enjoy the learning environment with Kaku san; his passion and learning spirit in dermatopathologist spikes my motivation. 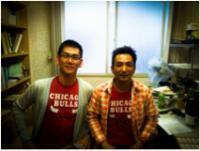 Dr Ogawa, a subordinate staff of Dr Fukumoto, from Nara Medical University Hospital joined us in the early of October. I am impressed by this younger dermatologist with such advanced knowledge in dermatopathology. It reflects the teaching effort by Dr Fukumoto; he had learned and imitated well from his teacher. Kaku san attended ASDP meeting and brought back a bright red Chicago bulls T shirt and more importantly learning materials. The detail and intensity of the teaching programmes in the ASDP meeting truly change my image of American. I must make effort to attend next year meeting. We have promised to bring at least poster there. The prolonged summer was finally over; it ended with a few days of heavy down pour and cloudy skyline. As the autumn set in, I am delighted with the cooler temperature. While the local are celebrating the autumn harvest festive, I am overwhelming and enjoying the local fruits as the price of the fruits and vegetables become reasonable. As for my learning, it is still far for me to harvest my result in this institute. I enjoy reading the enormous books collection in this institute. There are not only dermatology or medical textbooks (both in English and Japanese) but also historical text. 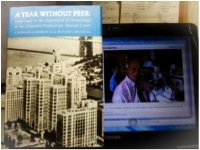 I found an interesting book titled “A year without peer” by the late Dr Ackerman and his best mate Dr Miller. I had a wonderful afternoon reading through his writing. In this book, Dr Ackerman described the training experience in his earlier years. Vast majority of the chapters were devoted to Dr Nelson; his teacher. The establishment of high standard for practice and learning in dermatopathology by Dr Ackerman which I believe influenced much by his teacher. Dr Ackerman’s hoped through his recalls and record, in future there will be more meritorious models in medicine. In my opinion, Dr Ackerman himself had continued this meritorious spirit in medical education and development. This spirit has landed and blossomed in many part of the word. I salute Dr Ackerman’s intelligent and determination in achieving high achievement in his career. At the same time I admire Dr Miller as a balance human being. As he described, a doctor who is married and has children is a juggler with four balls in the air concurrently: marriage, children, profession and intellectual growth. The maintaining, sustaining and continued development of a balance life is not easy. It is blessed as Sapporo city is built with marvelous cycling infrastructure consisting of marked lanes, tracks, shoulders and paths designated for use by cyclists. 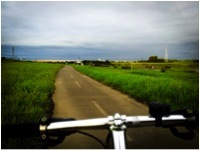 Best of all, there are several long bicycle paths. Along the Toyahira River’s bank, there is a 40 km of bicycle path lined from Sapporo Bridge till Jozankei. 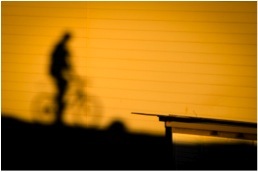 Shiroishi Cycling Road lined from Shiroishi ward till Kitahiroshima is another option. Both paths are relaxing during autumn. When the red leaves (紅葉) session arrive, I might consider Shikotsuko Cycling Road. Daily routine reading slides in this institute with Dr Kimura never fail to gain new discoveries and learning points. The enormous number of cases and repeated viewing of similar cases indeed sharpen my memory in recognizing them. 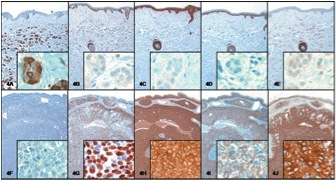 Details of pathology are emphasized to avoid repeated error. Unfamiliar cases for me just flow in constantly through time. Furthermore, there are numerous achieve cases both in virtual or stored glass slides to be explored. I must speed up my pace in my learning as well as my study project; there are only four months left. The passion of learning among my Japanese colleagues truly motivates me. Despite busy routine in their respective institutes; Dr Fukumoto, Dr Ansai, Dr Keisuke and etc, still manage to give rather impressive input for the daily virtual slides. Their knowledge in soft tissue and hematology pathology are truly outstanding; as they are from dermatologist background. Furthermore, I enjoy my study with the companion Dr KaKu; for constantly asking various thoughtful questions and sharing his idea. Last week, I was amazed by the spirit of learning from Dr Nakamura (中村考伸先生). He is a qualified surgeon, 10 years senior then me, yet still pursuing his dermatology training. He even spend time brushing up his dermatopathology skill and knowledge by revisiting the institute. I had successfully completed the Hokkaido’s marathon in 4 hours 30 minutes. Running under the hot weather is tougher than I thought. Will I do this again? – No way. I had learned the lesson; Sapporo can be very hot in summer. Anyway, I gained a piece of medal as memory and a bottle of spring water from Big Snow Mountain; as well as an extraordinary experience. My wife and my two girls came to visit me. We spent a wonderful time traveling Sapporo and surrounding scenic places with a tour group. I missed them very much and so thankful for my wife sacrifice for the family. 3100 [A through J] and 3400 [insets]).